An Assistant Register assists the Registrar in managing the academic and administrative records of an Institution. 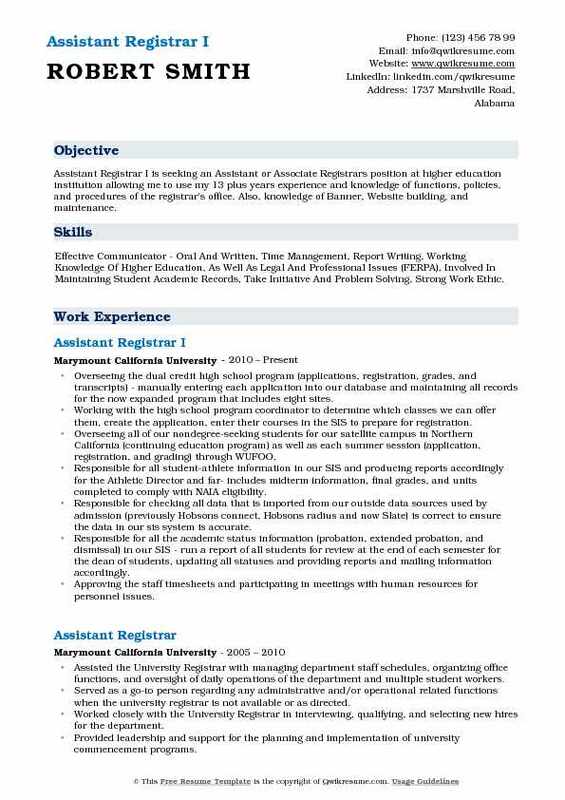 A well-crafted Assistant Registrar Resume should indicate duties and responsibilities such as supporting in student enrollment, implementing administrative procedures, issuing documents and transcripts, handling student’s database, maintaining academics related files, assisting staff in admissions and registrations, training new staff, delegating work, monitoring and reporting about students’ and staffs’ behavior, developing orientation class for students and staff, conducting enhancement classes for current staff as a way to enhance their skills and productivity and handling all other tasks assigned by the Registrar. Apart from theoretical knowledge, an assistant Registrar should be efficient in handling the admission operation and have extraordinary flair in academic systems and office Software applications. 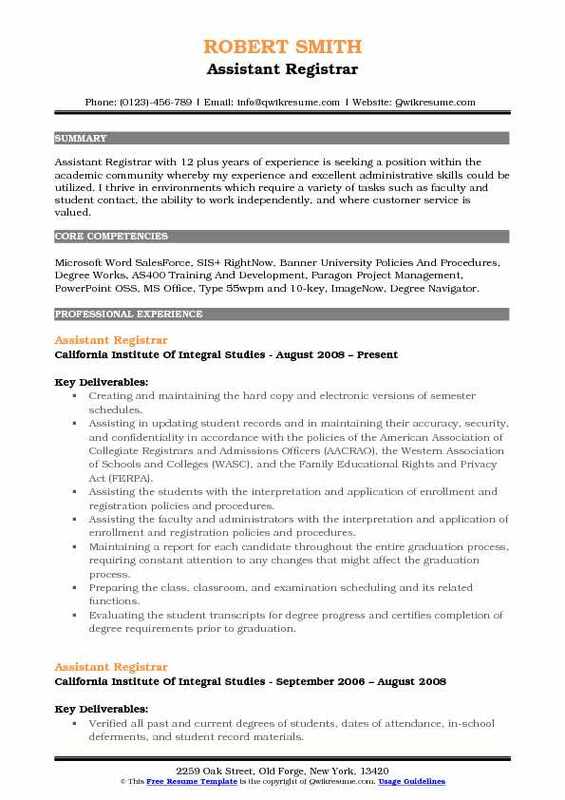 A Degree in Management or other stream coupled with some experience in operations at Registrar’s office will help candidates to land up in this job position. Summary : Detail-oriented Assistant Registrar with strong interpersonal skills, both written and oral with 11 years career experience in Higher Education Administration. Able to efficiently manage registration and scheduling processes, as well as maintain accurate personal, academic and enrollment records for hospital and student population. Demonstrates proactive leadership, collaboration with various college units and continual assessment of applications to improve outcomes. Managing the registration of all students from their first term through graduation. Cultivated relationships with students to increase persistence and university satisfaction. Informing the faculty about the procedures for attendance recording and posting. Ensuring compliance in regard to the college catalog, institutional policies and procedures, accreditation, federal, and state regulations. Managing student enrollment and course registration (MD, PhD programs, Masters programs, Qatar). Fostering the relationships with financial aid and student accounting to ensure compliance with Bundy, Title IV, NSLDS. Overseeing the medical board and hospital credentialing for all medical graduates. Responsible for the integrity of student information and all other confidential data, as well as its security and or disposal according to the ICME and middle states guidelines. Served as Designated School Official (PDSO). Managed visa and registration processes for all international medical students according to the department of homeland security regulations and protocols. Summary : Assistant Registrar II with 17 plus years of experience in the Education domain is seeking to obtain a challenging position that will provide opportunities for personal and professional growth while making positive contributions to your institution keeping production, security and integrity top priority. Reporting to the clearinghouse, services students, faculty and staff daily via phone and face-to-face. Processing the students verifications, pursuing training on the Database Management Systems (DBMS). Coordinating and supervising the registration of students enrolled at the university, including freshmen, transfer, continuing, off-campus, evening and other special category students. Scheduling classes and final examinations, with the responsibility to balance available space with curriculum needs. Advising the students in the matters relating to registration, transfer and permanent record. Collecting the pertinent student data, verifying for accuracy and completeness and assuring information is properly transmitted to the university registrars office for entry into the permanent academic record. Explaining the registration policies and procedures to students, faculty, staff and the public. Coordinating the procedures and registration for students with the off-site campus coordinator and the university registrar. Summary : Exceptionally dedicated and professional Assistant Registrar with 7 plus years of experience in the Education domain and a superb record of student, staff and administration support and satisfaction. Highly experienced working with a diverse population and able to function well independently and in coordination with other staff members. Highly experienced working in fast-paced office environments demanding strong organizational, technical and interpersonal skills. Reviewing student files and utilizing the degree evaluation tools to verify the completion of degree requirements and determine eligibility for graduation. Meeting with students on an individual basis to provide academic counseling and resolve questions or concerns about degree requirements. Monitoring the enrollment status and certify approximately 120+ students utilizing education benefits through the veterans administration and provide support and guidance as needed. Coordinating the registration process, including set up and providing staff direction, during dual enrollment, international orientation and SOAR (Student Orientation And Registration) sessions for incoming students every semester. Coordinating the development and management of the registrar's office website. Reviewing the transcripts for incoming and current undergraduate and graduate students based on previously articulated transfer credits in accordance with university policies and supports. Collaborating with the Registrar to build each semester in the banner, including registration timeline (dates), registration time tickets, semester drop code. 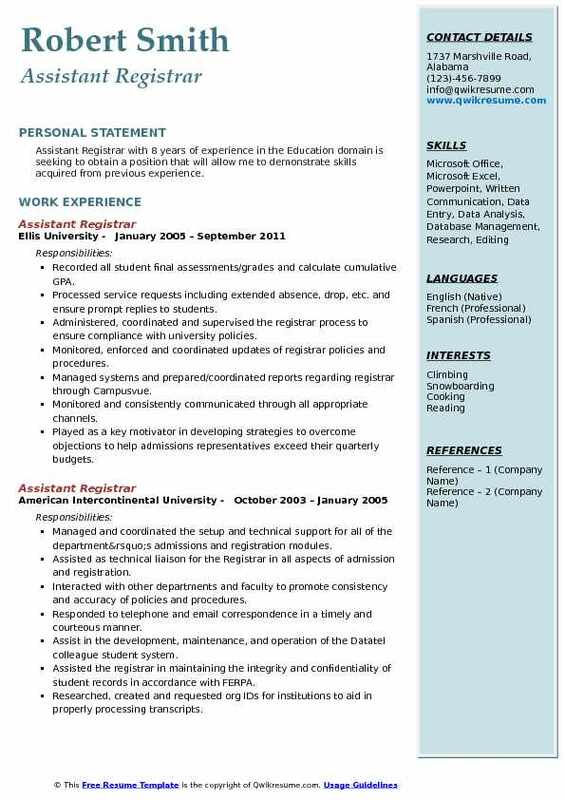 Headline : Self-motivated, multi-tasking, Assistant Registrar with 6 years of experience in the Education domain and with strong people skills seeking a position with an Organization that will utilize my experience and skills. 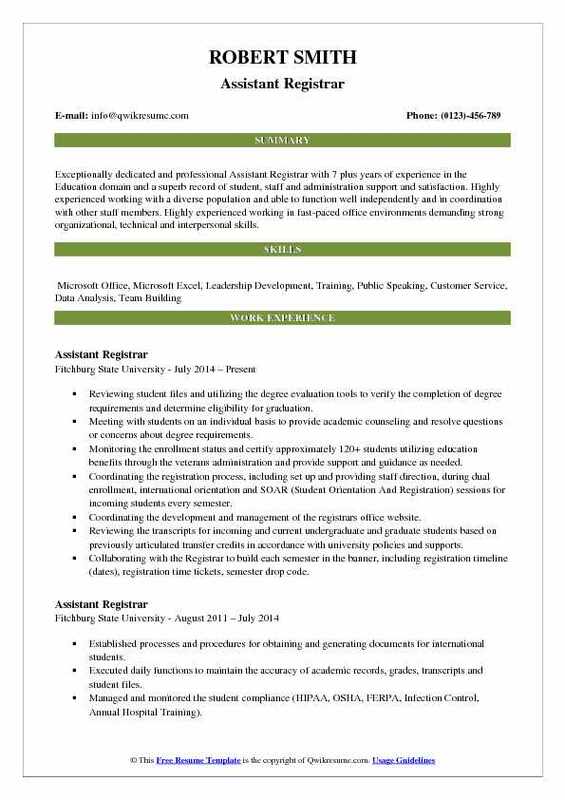 Skills : Bilingual English/Spanish, Proficient In Microsoft Office, Word, Excel, Access, PowerPoint, Outlook, Professional, Word Perfect 5.1, PeopleSoft And CampusVue 2000. Type 40 WPM. Consulted with other officials to devise registration schedules and procedures and coordinate dissemination of information on courses. Analyzed the statistical data on registration for administrative use in formulating policies. Directed the preparation of student transcripts, statistical reports on educational activities for government and educational agencies. Directed the compilation of information, such as class schedules and graduation requirement, for publication in school bulletins and catalogs. Managed the course changes including room changes, special event scheduling, or cancellations in Campusvue. Produced any non-electronic records as requested by FERPA or another official request. Managed the course registration for off-sequence students, LOA returns and reenters/reenrolls. Managed the attendance posting process - manual adjustments and tracking down unposted attendance. Performed address changes and enter additional demographic changes in CVUE. Summary : Assistant Registrar with 8 years of experience in the Education domain is seeking to obtain a position that will allow me to demonstrate skills acquired from previous experience. Recorded all student final assessments/grades and calculate cumulative GPA. Processed service requests including extended absence, drop, etc. and ensure prompt replies to students. Administered, coordinated and supervised the registrar process to ensure compliance with university policies. Monitored, enforced and coordinated updates of registrar policies and procedures. Managed systems and prepared/coordinated reports regarding registrar through Campusvue. Monitored and consistently communicated through all appropriate channels. Played as a key motivator in developing strategies to overcome objections to help admissions representatives exceed their quarterly budgets. Implemented new ways to energize and motivate staff in the office and during staff meetings. Maintained consistency by making monthly budgets of 8 enrollments per month. Expressed an upbeat and encouraging attitude in order to motivate and advance the prospective student to enroll in the MBA program. Summary : Assistant Registrar I is seeking an Assistant or Associate Registrars position at higher education institution allowing me to use my 13 plus years experience and knowledge of functions, policies, and procedures of the registrar's office. Also, knowledge of Banner, Website building, and maintenance. 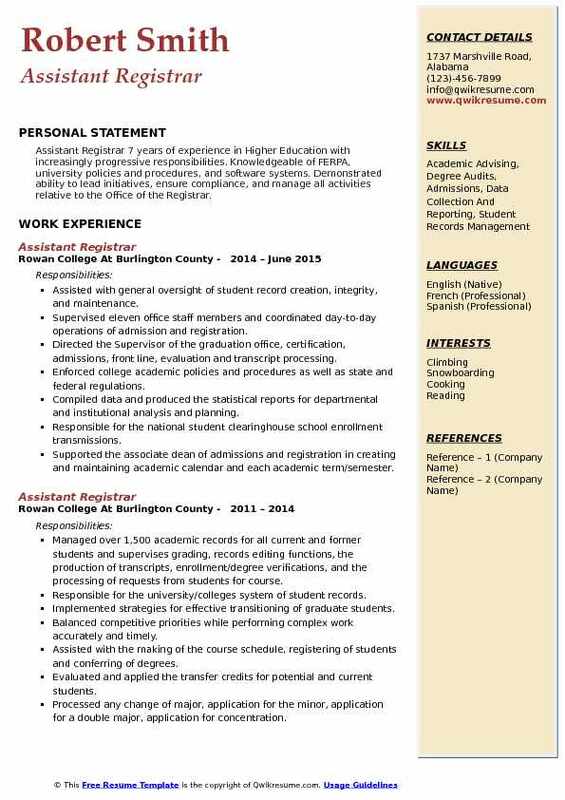 Skills : Effective Communicator - Oral And Written, Time Management, Report Writing, Working Knowledge Of Higher Education, As Well As Legal And Professional Issues (FERPA), Involved In Maintaining Student Academic Records, Take Initiative And Problem Solving, Strong Work Ethic. Overseeing the dual credit high school program (applications, registration, grades, and transcripts) - manually entering each application into our database and maintaining all records for the now expanded program that includes eight sites. Working with the high school program coordinator to determine which classes we can offer them, create the application, enter their courses in the SIS to prepare for registration. Overseeing all of our nondegree-seeking students for our satellite campus in Northern California (continuing education program) as well as each summer session (application, registration, and grading) through WUFOO. Responsible for all student-athlete information in our SIS and producing reports accordingly for the Athletic Director and far- includes midterm information, final grades, and units completed to comply with NAIA eligibility. Responsible for checking all data that is imported from our outside data sources used by admission (previously Hobsons connect, Hobsons radius and now Slate) is correct to ensure the data in our sis system is accurate. Responsible for all the academic status information (probation, extended probation, and dismissal) in our SIS - run a report of all students for review at the end of each semester for the dean of students, updating all statuses and providing reports and mailing information accordingly. Approving the staff timesheets and participating in meetings with human resources for personnel issues. 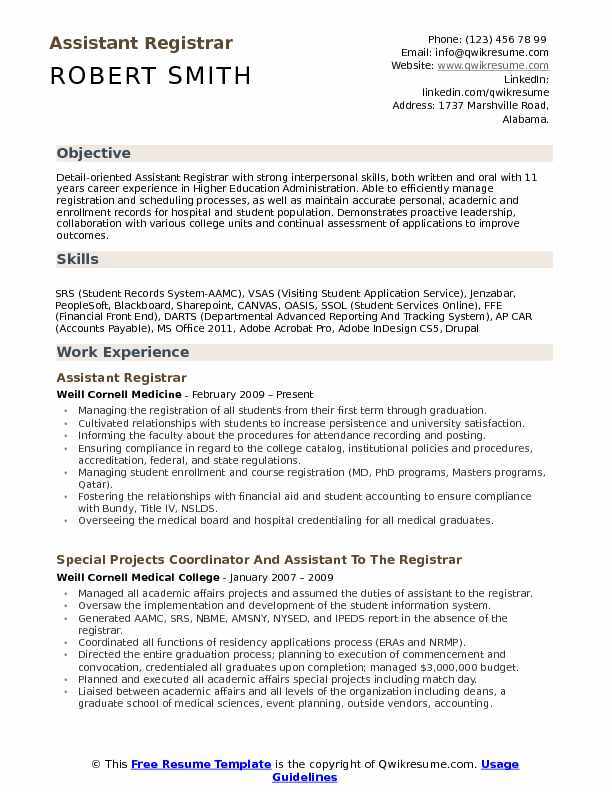 Summary : A strategic focused Assistant Registrar with 7 plus years of experience and with a decade of experience in state agency administration. Focused in the areas of university communication, project life-cycle implementation, non-profit leadership, and directed online communications. 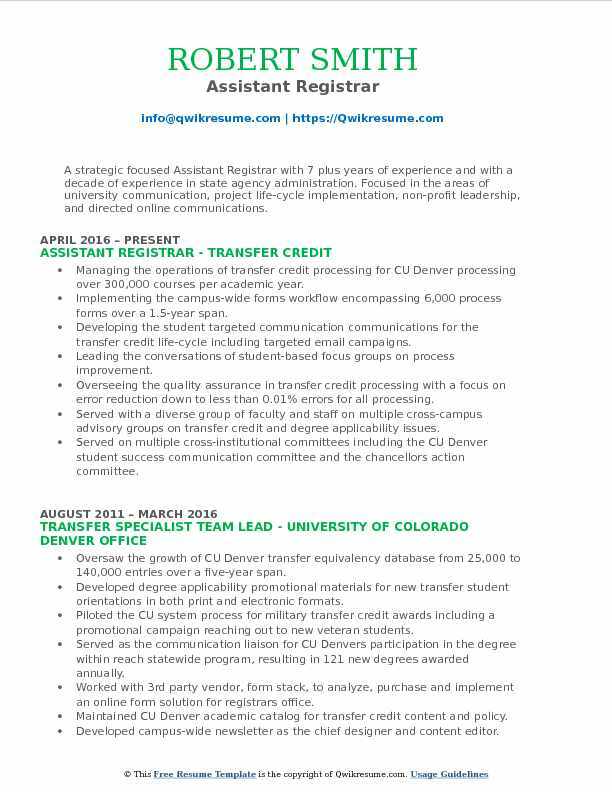 Managing the operations of transfer credit processing for CU Denver processing over 300,000 courses per academic year. Implementing the campus-wide forms workflow encompassing 6,000 process forms over a 1.5-year span. Developing the student targeted communication communications for the transfer credit life-cycle including targeted email campaigns. Leading the conversations of student-based focus groups on process improvement. Overseeing the quality assurance in transfer credit processing with a focus on error reduction down to less than 0.01% errors for all processing. Served with a diverse group of faculty and staff on multiple cross-campus advisory groups on transfer credit and degree applicability issues. Served on multiple cross-institutional committees including the CU Denver student success communication committee and the chancellor's action committee. Maintaining the collaborative relationships with faculty, students, and university staff. Analyzing and troubleshooting the automation of transfer credit processing and the outward messaging to increase the applicability of courses by 25%. Summary : Assistant Registrar with 12 plus years of experience is seeking a position within the academic community whereby my experience and excellent administrative skills could be utilized. I thrive in environments which require a variety of tasks such as faculty and student contact, the ability to work independently, and where customer service is valued. 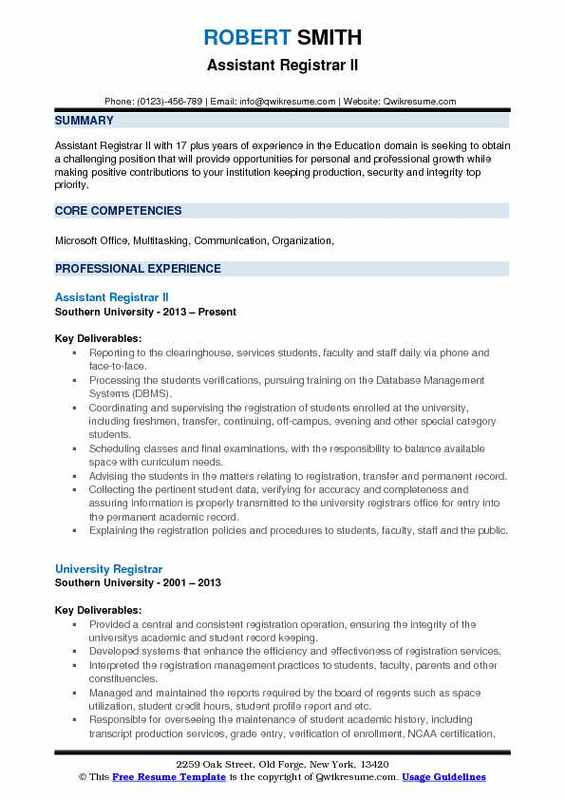 Skills : Microsoft Word SalesForce, SIS+ RightNow, Banner University Policies And Procedures, Degree Works, AS400 Training And Development, Paragon Project Management, PowerPoint OSS, MS Office, Type 55wpm and 10-key, ImageNow, Degree Navigator. Creating and maintaining the hard copy and electronic versions of semester schedules. Assisting in updating student records and in maintaining their accuracy, security, and confidentiality in accordance with the policies of the American Association of Collegiate Registrars and Admissions Officers (AACRAO), the Western Association of Schools and Colleges (WASC), and the Family Educational Rights and Privacy Act (FERPA). Assisting the students with the interpretation and application of enrollment and registration policies and procedures. Assisting the faculty and administrators with the interpretation and application of enrollment and registration policies and procedures. Maintaining a report for each candidate throughout the entire graduation process, requiring constant attention to any changes that might affect the graduation process. Preparing the class, classroom, and examination scheduling and its related functions. Evaluating the student transcripts for degree progress and certifies completion of degree requirements prior to graduation. Providing direct support to the central registrar in all issues related to institutional policies, procedures, and practices as it relates to student academic records. 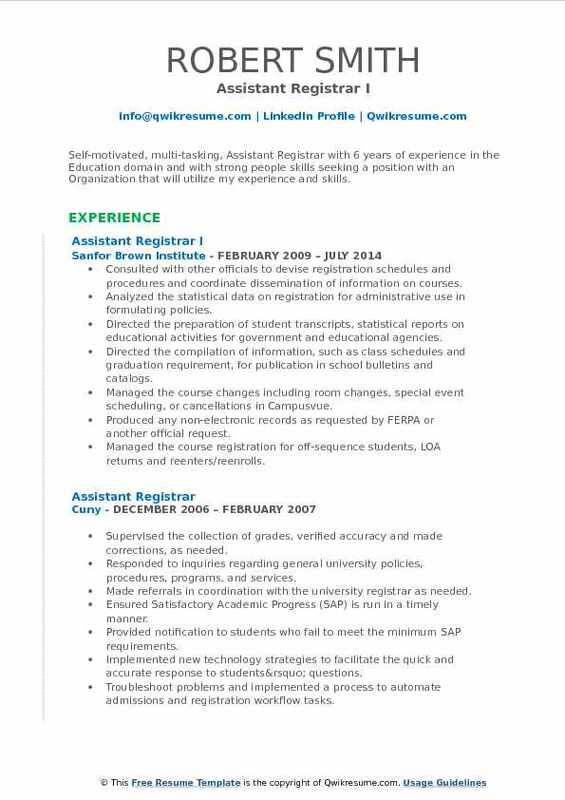 Summary : Assistant Registrar 7 years of experience in Higher Education with increasingly progressive responsibilities. Knowledgeable of FERPA, university policies and procedures, and software systems. Demonstrated ability to lead initiatives, ensure compliance, and manage all activities relative to the Office of the Registrar. Assisted with general oversight of student record creation, integrity, and maintenance. Supervised eleven office staff members and coordinated day-to-day operations of admission and registration. Directed the Supervisor of the graduation office, certification, admissions, front line, evaluation and transcript processing. Enforced college academic policies and procedures as well as state and federal regulations. Compiled data and produced the statistical reports for departmental and institutional analysis and planning. Responsible for the national student clearinghouse school enrollment transmissions. Supported the associate dean of admissions and registration in creating and maintaining academic calendar and each academic term/semester. Provided technical support to academic advising team, financial aid and recruitment offices. Provided problem-solving and customer service in a pleasant, professional, and timely manner to students, college employees and community members. Represented the associate dean of admissions and registration off campus at the new jersey community college registrars and admissions group meetings. 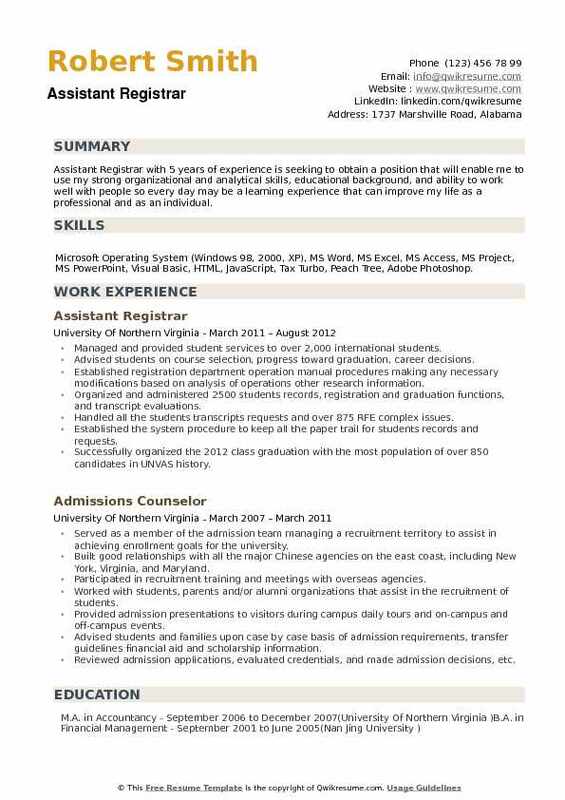 Headline : Assistant Registrar with 5 years of experience is seeking to obtain a position that will enable me to use my strong organizational and analytical skills, educational background, and ability to work well with people so every day may be a learning experience that can improve my life as a professional and as an individual. Managed and provided student services to over 2,000 international students. Advised students on course selection, progress toward graduation, career decisions. Established registration department operation manual procedures making any necessary modifications based on analysis of operations other research information. Organized and administered 2500 students records, registration and graduation functions, and transcript evaluations. Handled all the student's transcripts requests and over 875 RFE complex issues. Established the system procedure to keep all the paper trail for students records and requests. Successfully organized the 2012 class graduation with the most population of over 850 candidates in UNVAS history. Edited and proofread all the student service letters and publications related to registration on UNVA website. Managed the registration team of up to 7 people and motivated them effectively.